Nick and I love grilling. 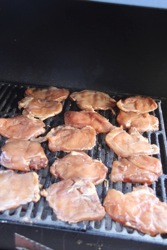 We love to have friends and family come over and have big barbecues. We started out with a little Weber Smokey Joe, then got an 18-inch Weber as a gift, and finally we upgraded with a new grill last year, and we are totally in love with it. In fact, we just had a barbecue this past weekend and had our cousins over (which was why I made the ice cream cake). Awesome times! The thing that is not so awesome about our grilling situation, is that we live on the side of a mountain, and in the afternoons especially, the wind comes roaring down the hillside. 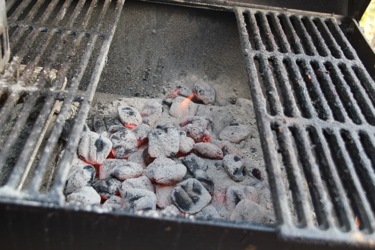 Being on the top floor, with our barbecue on our balcony, we don’t have any wind protection – and we used to deal with it every time we had a barbecue – it was such a pain to light the briquettes! 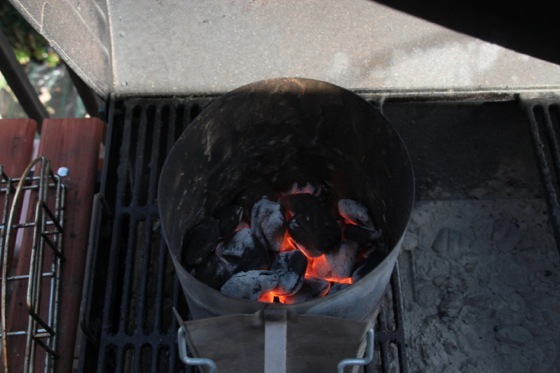 We’d try everything – people standing next to the grill in the whipping wind to try to create a shield, holding the lids of our previous Weber grills as wind blocks before we had our Char-Griller, using extra lighter fluid (that would just burn away and leave the charcoal unlit in the wind) … what a pain! So we bought a charcoal chimney starter. One of the most awesome inventions on the planet. 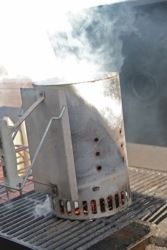 We’ve had the chimney starter for a while now, and it works perfectly. 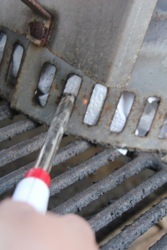 It’s so easy to get a fire going for the grill now … I thought. I hadn’t actually even used the chimney myself – Nick got to christen it when we first bought it, and since we got the Char-Griller, he’s been the one who’s started the coals every time (I told you we’re in love with it). 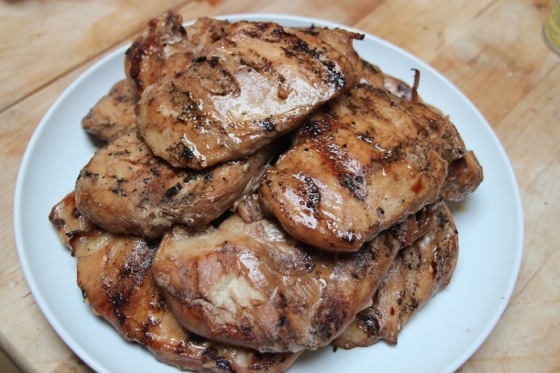 Well, we had some chicken breasts (like, 15) that we were marinating for the barbecue over the weekend, and we really needed to cook them. 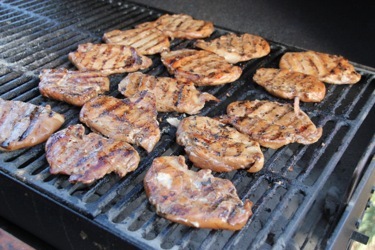 I knew Nick was getting home a little late tonight, so I decided to grill them before he got home. The use of a chimney starter is pretty simple: put coals in the chimney, crumple paper and load it into the bottom of the chimney, light. But of course since I was literally going to be “playing” with fire, I looked up this link just to be sure I had the instructions right. 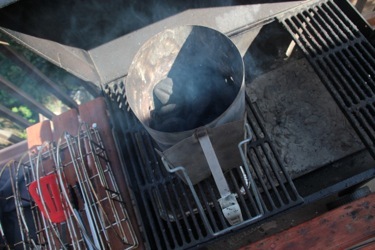 I put the coals in the chimney, and then got some paper towels and sprayed them with cooking spray (note: if you read the link above, the paper towel method is listed under the original, newspaper method – the site suggests that paper towels burn cleaner and leave less of a mess. It’s true!). I put the paper towels under the chimney (but didn’t remember to wrap them around in a circle for more even burning), and lit the paper towels. You’re supposed to light them in several places, but the whole thing actually got going pretty quickly because it was a little windy. Smoke filled the chimney pretty fast, and I just hoped the fire of the paper towels would burn long enough to light the charcoal. 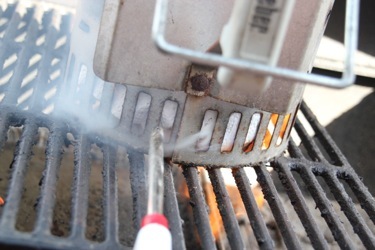 Where there’s smoke, there’s *hopefully* a bit of fire, when it comes to barbecuing. I’d just have to wait and see. 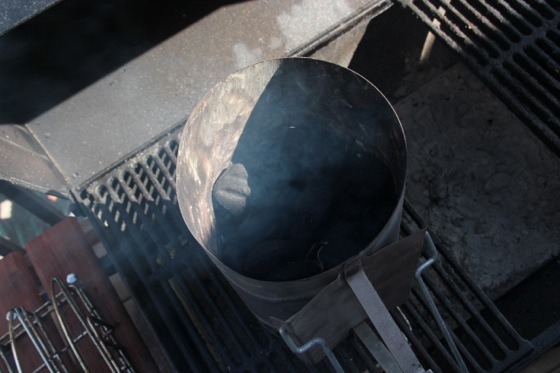 I went back about five minutes later – was that a little bit of ash I see on the underside of those briquettes? I decided to wait a little while longer before checking on them again. When I came back, hooray! 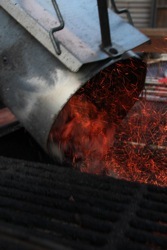 The coals had definitely caught, and were ashing over! And got my grill on! This was so, so, so ridiculously easy and fast. I can’t believe we ever had the patience to grill on our windy balcony all those times without a chimney starter, and I’m so glad we got one last year. 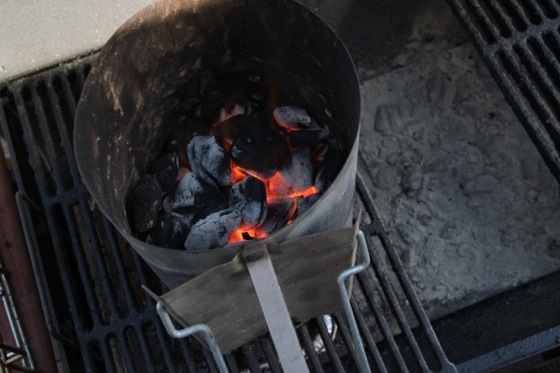 I thought it would just be neat to use it myself, but I’m really glad I did – I really can’t say enough about how much easier it is to get the grill going with one of these. Love it!